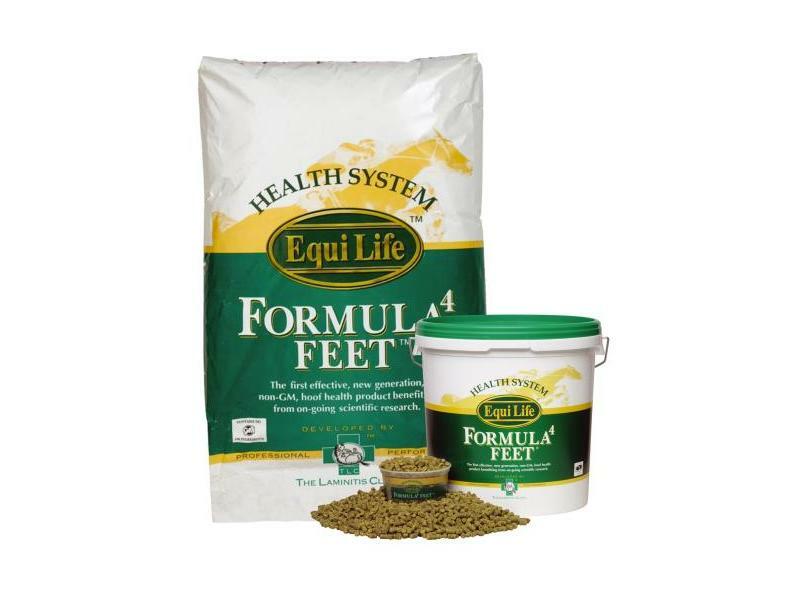 Innovative and exclusive, the Equi Life Formula 4 Feet is a branded equine hoof supplement, distinguished in its field as the world's first non-GM hoof and laminitis support. Administered for the relief of weakened or cracked heels and hooves, or as a preventative remedy for hooves at risk of laminitis, the nutritionally tailored formula combines a healthy balance of essential vitamins, amino acids and 65 micronutrients, including magnesium, calcium and phosphorous. The GM-free formulation has revolutionised the supplementation industry, showcasing ethical production and environmentally accredited policies of development. In order to ensure the quality and performance of the Formula 4 Feet, as well as to certify its non-GM status, testing is observed at the leading global forensic laboratory for equines. Beside its nutritional benefit, the palatable pellet offers a delectable addition to regular dry or wet mix. Equi Life Ltd, the distribution arm of The Laminitis Clinic, has launched a ‘New Generation’ supplement, Formula4 Feet, providing unique benefits for both horses with poor hoof horn quality and those at risk of laminitis. 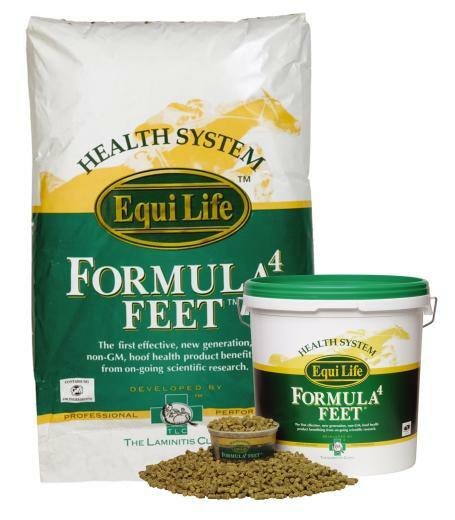 Robert Eustace FRCVS, Director of the Laminitis Clinic, developed Formula4 Feet in collaboration with Dr. David Frape, the country’s leading equine nutritionist. Mr Eustace is increasingly disturbed by the insidious increase in GM ingredients in horse feeds. He takes the view that the consequences of feeding GM ingredients are unknown and that until extensive research is undertaken, to prove safety both to animals and the environment, it is prudent to avoid such materials. 1. Formula4 Feet is the first non-GM hoof supplement to be made anywhere in the world. It is manufactured in the UK in a drug free, Soil Association and UKASTA approved facility. 5. Formula4 Feet provides over 65 micronutrients, in a highly palatable pellet. Due to it’s comprehensive formulation Formula4 Feet is an excellent general supplement to help keep your horse in tip top health. 6. Formula4 Feet provides a daily dose of 20mg biotin for a 450 kg horse. Most studies on the effects on hoof horn by supplementing with biotin, indicate that 20mg daily is necessary to achieve consistent improvement. 7. Formula4 Feet provides over 3 grammes of calcium per day balanced with magnesium and phosphorus. Calcium has been shown to be important in inter-squame attachment in hoof horn. 8. Formula4 Feet provides zinc as both organic and inorganic forms, providing optimal availability, yet allowing the horse to retain intestinal selectivity during absorption. Zinc is important for correct hoof horn growth; deficiency results in parakeratosis. 10. Formula4 Feet provides generous amounts of phospholipids, from natural ingredients. Phospholipids are essential dietary components for incorporation into all cell membranes. This function is vital throughout the body, not only in the hoof, where phospholipids are intimately involved in keeping the horn free from infections and maintaining a normal water balance. 11. Formula4 Feet contains no cereals and no added selenium. Cereals are high in soluble carbohydrates and are not recommended for laminitis cases. Excessive selenium is thought to contribute to hoof horn infections and can be toxic if over supplemented. Selenium toxicosis causes poor horn development with a dry scaly appearance to the hoof and if given in greater amounts can lead to the horse shedding its hooves or even death. 12. Formula4 Feet contains Vitamin A which is important for a healthy epithelium. The hoof, coat, mane and tail are all part of the epithelium. 13. One of the main causes of laminitis is obesity, leading to glucose intolerance, insulin resistance and diabetes mellitus. Research at the Laminitis Clinic indicates that obesity and insulin resistance may be a forerunner of Cushing’s disease. Formula4 Feet is a revolutionary new formulation which provides nutritional support against these syndromes, helping to keep your horse healthy. Formula4 Feet should be used in combination with a low calorie, high fibre diet to help prevent laminitis. 14. Formula4 Feet contains the amino acids lysine and threonine. Lysine and Threonine are the two most important rate limiting amino acids, if they are in short supply, protein and energy metabolism is inhibited, preventing your horse from getting all the goodness from his food. 15. Formula4 Feet contains optimal levels of antioxidants including heat stable Vitamin C, Vitamin E, copper and BHT. Antioxidants not only help keep Formula4 Feet in fresh condition but, when assimilated, act to prevent free radical damage to cells and cell membranes. 16. Formula4 Feet contains omega 3 fatty acids, which by their competitive metabolism, during the desaturation of n-6 fatty acids to the inflammatory eicosanoids, gives Formula4 Feet anti-inflammatory properties. 17. Formula4 Feet contains the amino acid arginine, which is the precursor for the formation of nitrous oxide in the tissue circulation. Nitrous oxide is a powerful vasodilator i.e. causes the blood vessels to widen, which encourages greater blood flow and tissue perfusion. Laminitis is thought to involve vasoconstriction and ischaemia (lack of blood flow to the laminae) in it’s pathogenesis. 18. Formula4 Feet contains balanced amounts of bioavailable magnesium. Deficiency may be associated with glucose intolerance and insulin resistance, both of which are commonly associated with laminitis. Experience at the Laminitis Clinic has shown that laminitis cases often show abnormal magnesium balances in blood and urine samples. 20. Formula4 Feet contains natural plant sources of Vanadium and Chromium. Vanadium is vital for insulin intra-cellular signalling and thus important in cases of insulin resistance and diabetes. Chromium, in combination with other ingredients in Formula4 Feet, is involved in the formation of glucose tolerance factor by the horse. Glucose tolerance factor has shown the potential to reduce blood glucose and free fatty acid concentrations in diabetic subjects. Glucose tolerance factor is important in combating insulin resistance and helping to prevent obesity dependent laminitis. 21. Formula4 Feet contains tyrosine and phenylalanine, both important precursors of the neurotransmitter dopamine which is in short supply in pituitary dependent Cushing’s disease cases. 25. Formula4 Feet comes in re-sealable, re-cyclable, waterproof and u/v lightproof containers. Below are some recent questions we've received regarding Equi Life Formula 4 Feet for Horses, including answers from our team. Can you please let me know if there is any Alfalfa in this product as my youngster is severely allergic to it. I'm afraid the Formula 4 Feet does unfortunately contain alfalfa. As an alternative, NAF Five Star Profeet for Horses is also a popular hoof supplement which NAF have advised does not contain alfalfa in the powder or liquid variety (the pellet form does however contain alfalfa). Nah haylage balancer with formula feet? Hi I have 15,2 Welsh section D mare, who is at moment weighing in at 452kg on tape.she is at her leanest as had a boutique of lami this summer, bk out on minimal grass so feeding her usual feed.which is Naf haylage balancer molasses for chaff garlic granules salt and tumeric. Haylage balancer advised by vet two yrs ago when she had very first lami but. She's normally a good doer and has done well on above feed. Recently she has lacked energy in school but fine when hacking. Anyway I feel she is lacking bit of muscle and at this time of year hooves on front not great, chiped. She has had formula for feet in past n did good on it lots of energy too, but she wasn't on Naf haylage balancer at the time. So can I use it as a supplement or would I overload her with minerals etc using both. Also she has hay.,thanks. It is fine to give formula 4 feet along with the current feed she is on. I have a similar problem with my horse's feet at this time of year and have found applying Kevin Bacon hoof dressing twice a day is also very useful to stop feet drying out and crumbling. My horse is a good doer and has spillers original balancer and a small amount of chaff. Can I feed this along side safely without causing overload of minerals? He's a tb and although has always had good feet for his breed he's had two years of illness and surgery and his feet have become crumbly at the bottom now he's back in work. The levels of minerals such as magnesium and calcium are not included in either the supplement or feeds at levels where toxicity is at all close. You should be able to use both of the supplement alongside his feed without any danger of giving too much of any minerals. I have a good doer on restrictive grazing. His frogs suffered due to the wet winter. His left hind frog is still not growing back at the same pace as the others. He is currently on Feedmark C-plus, biotin and D& H mobility. Would this supplement be suitable? presumably I would need to stop feeding biotin and C-plus. This is a well regarded supplement and there are certainly reports of good results using it. Given the lack of progress you have seen so far, I would agree that this would be worth trying in place of the Feedmark product. You could probably continue with some biotin as this is not toxic even in much larger amounts than you will give. Good general hoof care, following the advice from your balcksmith, is also important while the structures are recovering. My 7-year-old 17hh Cleveland Bay is a recovering laminitic - currently doing well on full grass turnout which I will restrict when the grass starts growing. I currently feed him on Thunderbrook base mix plus a scoop of molasses-free chaff. Can I also feed him on Formula4 Feet or should I swap one for the other? Obviously my aim is to stop him gaining weight. Thank you. This should be a very good supplement to give to your horse. It can be added to what you are using now. The aim is to give this along with a high fibre, low energy diet. You are right that when the fresh grass is coming through, access should be limited and high fibre food given. Hi, are there are ingredients that could cause an adverse affect, such as a skin allergies? My horse came up with little lumps under the skin on her back a few days after starting to feed this. I don't know whether this is a coincidence or not. Any advice would be appreciated. I suspect that this will be a coincidence because the ingredients in this product would not normally cause any such reaction. However it is certainly theoretically possible for this to happen and an individual can sometimes react to almost any every-day product. The only way you will know will be to withdraw and then re-introduce the product, leaving enough time in between to properly assess exactly how things are. If the skin lumps persist, I would suggest you do this. Otherwise of course it would be best to ask your vet to check them. I am currently supplementing my horse's feed with NAF 5* balancer - would formula for feet cause me to be feeding too much of any minerals please? The levels of minerals such as magnesium and calcium are not included in either supplement at levels where toxicity is at all close. You should be able to use both of these supplements together without any danger of giving too much of any minerals. The essential nutrients provided will get into your horse's system as soon as you start feeding the product. However there are lots of other factors which are involved in the healing response, such as amount of infection remaining, amount of damage to the underlying tissues, age of horse and lots of other factors which will be individual to your horse. All that can be said is that if the nutritional balance provided is as good as possible, then nutritional factors will be a helping it to heal as fast as it otherwise can. There will still be a lot of variability between different horses. Doseage for a 550kg horse please? Per 100kg weight, a horse should be fed 37.8g daily. A 550kg horse should receive 207.9g daily, so a 7kg bag should last your horse about 33 days. This is regarded as a good quality supplement and should be suitable for your mare. It should be given every day and takes a few weeks to have full effect.